Russian travelers Feodor Konukhov and Viktor Simonov plan to undertake the longest ever dog sled expedition from the North Pole to the southern coast of Greenland. The weather is going to be the travelers' most difficult challenge. Covering 4,000 km of uninhabited icy territory within four months is a very challenging task. The expedition is going to start at the North Pole on April 6. Konukhov and Simonov plan to reach southern Greenland by August. Viktor Simonov talked to the VoR about the goal of the expedition and major challenges. “We are in for a very difficult route. We will have to travel some 800 km across the Arctic ices. The second stage will be to ascend the ice shield and then travel through Greenland itself. The goal of our expedition is to confirm Russia’s intention to strengthen its presence in the Arctic,” Simonov said. Konukhov and Simonov set off from the town of Petrozavodsk on April 3. Tracking buoys will be with them throughout the journey, sending geographical coordinates to the headquarters in Moscow and Petrozavodsk. 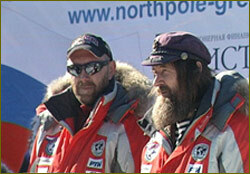 Internet users will be able to track the expedition after April 6 on an interactive map at www.northpole-grenlandia.ru. City news archive for 04 April' 2013.